How could I have known that I belong to this place I had never been before? Eiheiji feels so familiar. It has a sense of being closely held, and it has a very human scale, belying it's capacity to train hundreds of monks. Walking very slowly through the corridors, my new Japanese colleague and I were led by the Jisha (Attendant), who carried a paper lantern, lit only by a single candle. He took care to point out the places where one might misstep, and he spoke so politely that I had difficulty with some of the conjugations that were then translated by my Anja (Assistant). We were shown each place of practice. Walking in the outer corridor of the dimly lit zendo, I had a deep sense of Dogen's presence, his profound sincerity and resolve. I feel very at home in Eiheiji, and I felt Dogen's teachings about attention to detail, generosity, and grandmotherly mind come to life. The head of the International office, Rev. Taiken Yokoyama, also accompanied us for part of the preparations. His ease and willingness to help were evident. Later, after the ceremonies had all been performed, he invited me to his office. We spoke for a long time about American Zen, where he'd practiced for a number of years, and about the difficulties of leaving one's training temple. We exchanged cards, and he welcomed me back. I look forward to being in touch with him again before too long. The ceremonies went very smoothly, though I made note of how nervous my Sojiji colleague was. It must have felt very awkward for him, just as it had for me at the other Head Temple. After breakfast I spent the rest of the morning enjoying the tall, tall pines and the pools on the Eiheiji temple grounds. There are so many lovely places tucked into the greenery of that hillside, including a pond with a huge frog. This, of course, reminded me of Suzuki Roshi who loved frogs. I also made an offering at the lay sangha memorial hall, acknowledging their crucial role in making this Way possible for everyone. Their contributions and Dogen's remind me that I can take the bodhisattva vow only because I am held within the vows of other bodhisattvas. Concluding with Zuise at Eiheiji was just right. It feels like the perfect end to the long road of Dharma Transmission, each step a place of practice and awakening to the Way of Zen. I have recently returned from a trip to Asia, where I completed a series of ceremonies that acknowledge my Zen Dharma Transmission. They are collectively called "Zuise" and they grant me various titles including Resident Head Priest (Jūshoku) and Teacher, Reverend, or Venerable (Oshō). Practically speaking, this means that the Dharma Transmission I received in the United States with Shosan Gigen Victoria Austin is now also recorded in the official records of the Soto Zen Buddhist administrative body in Japan. I believe that there are only about 40 individuals in the US who have completed this practice, all of whom have trained with teachers who practiced in Japan, but not all of whom have actually practiced in Japan as I did. Even so, I am not particularly concerned about titles or about status within the American or Japanese systems. So why go? What does it mean? Naturally, some have asked about the purpose of this trip, given that it is not necessary to have any certification in order to lead a Zen sangha or teach Zen in America, things I am already doing. There are many reasons and many implications. I hope to express some of them in my travel logs from the trip. My plan is to post to this blog about the trip over the course of several days. To respond a bit to the question, I feel that, in a way, this process is following through on my initial ordination as a priest with Sekkei Harada Roshi, the Abbot at Hosshinji in Obama, Japan. That ordination, which occurred in early 2007, and the three subsequent practice periods (ango) that I completed in Japan were all recorded in the official records at the time. That is, I had already received the standard basic training of a Zen priest as it is currently offered in the home of the tradition, and the guidance of a respected Zen Master. My early priest training included a wide range of practical matters, such as how to wear the robes properly, eat formal meals, and perform basic ceremonial functions. When returning from Japan in 2008, I continued my relationship with Vicki and followed through with further training here in America. More importantly though, all of Soto Zen is the passing down of Eihei Dogen's style of Buddhist practice, his intimacy, vigor, and embodied expression. In my years in Japan I had never visited the Head Temples of Soto Zen, preferring instead to travel directly to my home temple. Still, my life is dedicated to the way of practice that was developed by these men, Dogen and Keizan. By visiting their temples, I sensed so much more about them and what they deemed important enough to pass on. And I reflected upon myself as an instrument of that Dharma and as a teacher leaving a legacy. What is this ancient Way, and what will it become? Since American Zen is less than 70 years old we, its practitioners, will have a strong influence on the direction it will take. I hope that we can do so thoughtfully, informed by the depth and breadth of our teachers. At LaGuardia airport, as I was leaving New York, the TSA staffer was going to sort through my bag, to look for something that shouldn't be there. I was carrying my breakfast in a paper bag. As I was standing in the area awaiting my bag's review, there was a Japanese couple undergoing the same process. They had a yogurt with them that might have to be thrown away. They seemed to be having trouble understanding what the TSA staffer was trying to tell them, so I added a bit of my broken Japanese to help make it clear. They were grateful. Seeing their situation, I realized that it was the yogurt in my breakfast that was likely to be the problem too. It was a different person who was going to review my bag, so I mentioned to him that I thought it might be the yogurt. The young man agreed that as probably the issue. He explained that I could go back out of the TSA area and eat the yogurt, or he could throw it away. I said that I'd prefer not to have to go through the line again, and would be okay with losing the yogurt. It was then that things turned. The TSA staffer inspected it to make sure that it was sealed and then seemed to pause, not putting it directly into the trash. He seemed to hesitate. I watched silently, without moving to take my things, and then saw him gently tuck the yogurt back into the paper bag and start to turn away. I quietly thanked him and slowly picked up my things to go. It seemed that he felt enough kindness to tuck the yogurt back into my breakfast bag, rather than confiscate it. This created a tickle of joy, hopefully for both of us. Maybe this happened because I initiated with a "good morning?" I don't know, but it was pleasant to think about sneaky compassion as I boarded the plane. Upon arriving at Narita airport, I was approached by a group of people from a Japanese television station. I guess I wasn't sneaking compassion into Japan after all; it was going to be plainly visible. They were doing "man on the street" interviews, or in my case American nun on the street. The journalist asked all sorts of questions about how I came to be practicing in Japan, and ended by asking for my teaching in a nutshell. Saying one word, on camera, before even leaving the airport, I guess it is all in a day's practice. He seemed not to know anything about Zen Buddhism, and he was more interested in the places that I would be visiting. At the end of the interview, though, he admitted to feeling anxiety about approaching people to interview. He asked what to do about this. I spoke about checking in with the body and returning to an acceptance of whatever might be there. The reporter nodded his head, as though it made sense. The grey sky is now clearing in Yokohama, and I am having a leisurely breakfast before the plunge into Sojiji. The brightly lit restaurant, with its low stools and straight counter, runs on the basis of meal tickets. The machine is impatient. Because I take a little extra time to look at the images and try to guess at the food that is offered, it keeps reverting back to the lock screen, asking me to start over again and again. Typical. On the third try I am finally able to buy a ticket. All the while a man at the counter has been watching and making understanding noises, and he is happy to see that I have managed to purchase the ticket. I sit down one seat over from him and we smile at each other. Later, I ask him to take my picture and, finally, he waves and smiles again before leaving to catch his train. 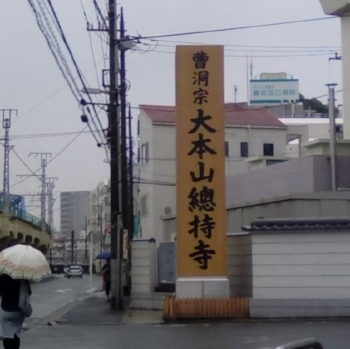 The sign says "Daihonzan Sojiji"
The monastery sits just behind the train station, out the window of my hotel room, a crouching dragon in the city. It was rebuilt here after a fire tore into the original location in Ishikawa on the Noto peninsula. There are remains of the first Sojiji there, and the area is said to be beautiful. I don't know, having never been there. The new Sojiji, built in the late 1800s, is massive but it is tucked among the streets and buildings of the bustling sea port of Yokohama. Even from the street entrance there is little hint of the swooping roofs and the stalwart gate. Riding this dragon is sure to be interesting. It was raining diligently as I trudged up the slope toward the gate at Sojiji, the temple whose name means "the place where the Buddha's teaching is fully kept." This weather perfectly suited my feeling about the upcoming ceremonies, grey and a bit heavy. Complex ceremonies are not my strong suit, and I had not been to either of the temples where I would be performing them. I wondered how the events would unfold. Sojiji has an imposing presence. The carved wooden guardians housed at the gate stand several stories high, their fierce faces looming large. The Dharma hall (hatto 法堂) in which ceremonies take place is so vast that there are jumbotron monitors set up on either side of the altar, so that those who are seated in the back can see the activities being performed up front. There are a dozen steps, all deeply lacquered and polished to a brilliant shine, leading from the floor of the hall up to the memorial plaques at the top of the altar. I had never seen such a large Zen temple before. I happened to arrive at the same time as two other priests, a French woman and Japanese man who had both traveled from Europe. Their friend, who interpreted a bit, said that it had been decided that the four priests who had turned up for Zuise that day would perform their ceremonies together. After the preliminary ceremonial requests, we were lead about to "set ups," places that had been made to look like the places where the ceremonies would happen. However, in order to preserve the rules, we did not actually see some of the locations until the next morning. Zuise (瑞世 ) is a word that has sometimes been translated as "debut." It literally means "investiture with a jade tablet" (zui 瑞) upon entering the "world" (se 世) because, in the Song era in China, the Abbots of large public Buddhist monasteries were appointed by the imperial court. These days, Zuise is a series of ceremonies performed by those who have received Dharma transmission in a recognized Soto Zen lineage. Zuise-shi, as they are called, are monks who are the Abbots of the Head Temples for a single day. I had traveled to Japan specifically to perform Zuise at the two Head Temples of Soto Zen, Sojiji and Eiheiji. I was not surprised that the ritual forms of Sojiji were different from the ones in which I had been trained, but I still found them confusing. After many years of practice the body has certain tendencies. Even so, my new colleagues and I managed to get fully through the dozen events of the 24 hours. Formal photos followed. Yet this is really not about ceremonies or titles. It is about having a lived experience of each other as descendants of the founding teachers of Zen. Keizan was peering through the eyes of those I met over the course of two days at Sojiji. His practice was present. The things he felt most important to pass down were enacted, particularly through the monks who live and train at Sojiji, but also through me. That is, the teaching is kept in each one of us, as each one of us. Keizan's words from the Transmission of Light, the Denkoroku, come forth: "...the work of teaching has come down through questioning and answering...If you can evolve and practice in this way, then you will not be disappointed by your own faults, and you will not be deluded by your own birth and death."